Making your annual mashed potato/gravy sculpture seem like a mound of mush in comparison, artists have taken the art of playing with food to strange -- often super-creepy -- new heights, the likes of which make even a gingerbread house made by Frank Lloyd Wright look like something some Dutch kid just pasted together. They're weird. They're (often) wonderful. 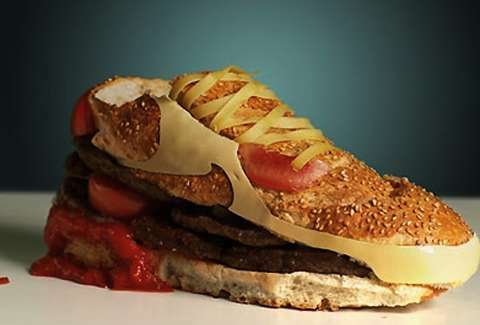 They're edible. Check them out. 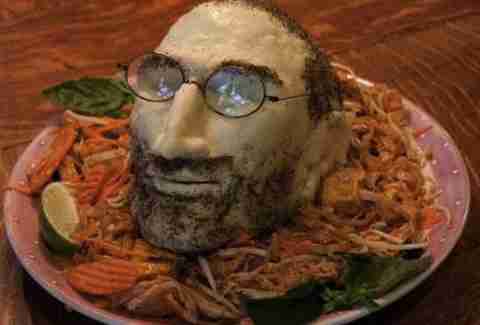 In order to pay tribute to the master innovator, the dudes at The Cooks Den offered up a step-by-step guide to making a mozzarella-based head of Steve Jobs that's probably way more convincing (and way less creepy) than that Ashton Kutcher movie. 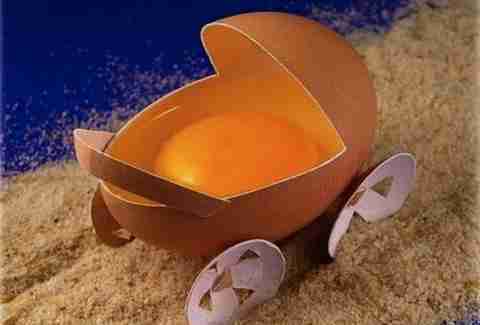 Is it a pro-life statement, with the egg (fetus) finding comfort in the shell (womb)? No. No it's not. Sorry, Texas. 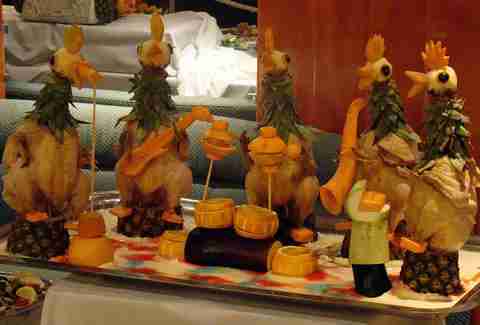 Butter sculpting is one of the weirdest and most widely practiced of all food sculpture forms, with people making everything from the president to Michael Jackson out of the cow-paste. 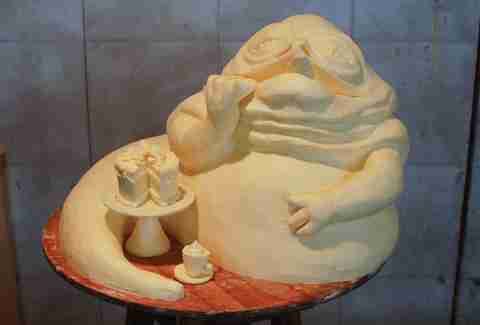 But few demonstrate exactly what eating a butter sculpture would do to you quite as accurately as this all-dairy rendering of Gerard Depardieu. 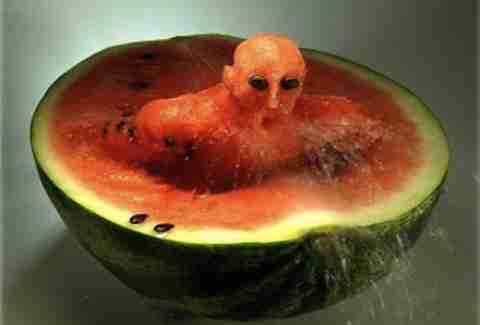 This watermelon swimmer is probably the kind of thing Michael Phelps thinks he sees sometime around 4:22p when he's super hungry. Like Mos Eisley as imagined by Col. Sanders, you'll never find a more wretched hive of scum and Salmonellany than this all-poultry rock band, whose instruments are made of various fruits and veggies. This is the kind of thing that haunts PETA's dreams. On one hand, they could totally see it as an expression of how meat is murder. 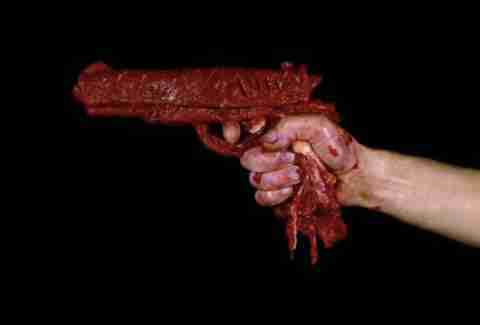 On the other hand, it's made of murdered meat. 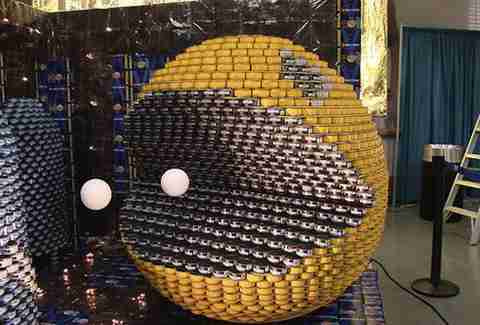 Like the butter sculpture before it, canned-food art's also a mainstay of many a county fair, where people make everything from beer-can versions of The Simpsons to this crazy, 3D Pac-Man, complete with mysteriously hovering power pellets that you totally can't eat. 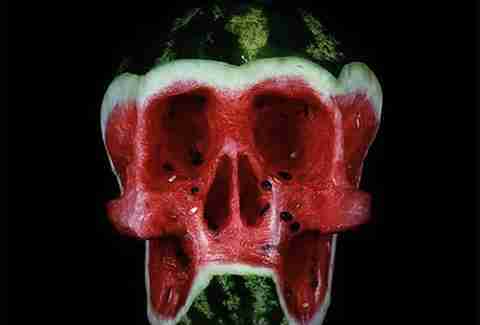 There's a message in here, and it's: "Fruit is bad for you." This message brought to you by the Friends of Processed Foods International. 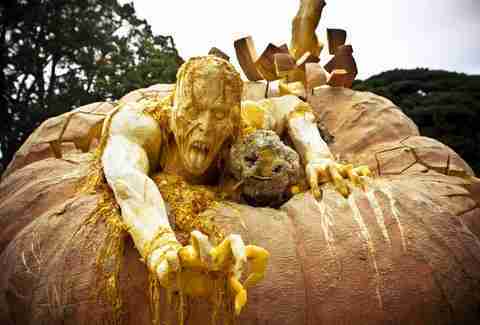 Representing some poor farm kid's worst bachelor party nightmare -- either that, or the kid really likes ugly strippers and hates cake -- this gigantic gourd's like a zombie jack-in-the-box, and probably got even more terrifying after it began to rot. 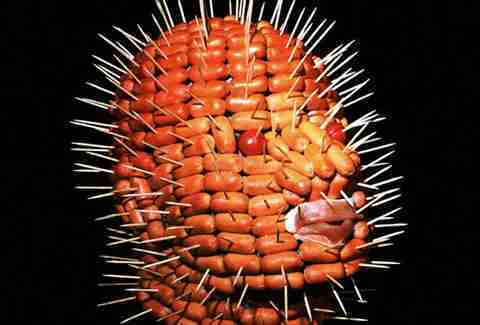 Allowing you the opportunity to take an actual bite out of a Cenobite, this Pinhead replica is composed almost exclusively of Little Smokies, those ultimate toothpick-based treats that also totally raise hell in your stomach. 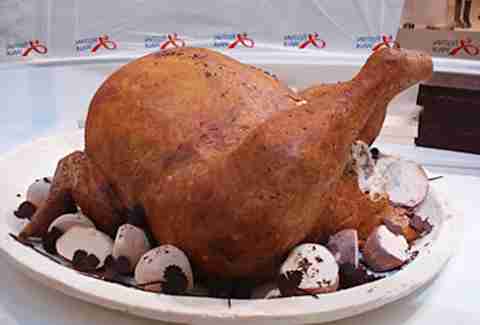 Forged completely of chocolate, this turkey represents perhaps the best Thanksgiving feast ever, unless you wouldn't be grateful for the opportunity to eat a gigantic hunk of meat-shaped chocolate, in which case you're kind of a bummer and nobody wants you at the dinner table anyway.